Taking inspiration from IDW Publishing's Doctor Who comic series, this ultra-stylized vinyl statue offers a unique interpretation of your favorite character from the world's longest-running sci-fi TV show of the same name. The Eleventh Doctor is suited up for adventure in his jacket, waistcoat, and bow tie (of course), ready for whatever the universe throws at him. A limited edition of 3,000 pieces world wide, each statue comes with two interchangeable heads so you can choose from Eleven's trademark quiff or fez! 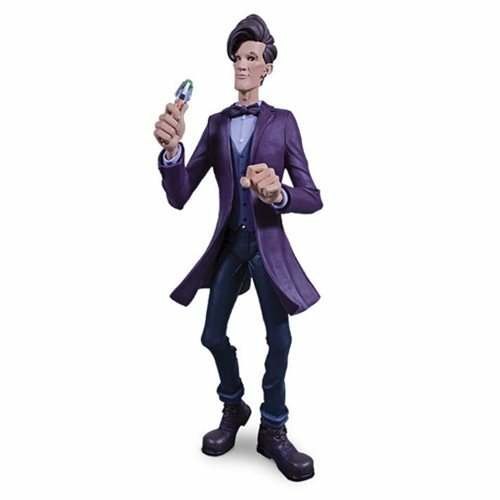 The Doctor Who 11th Doctor Purple Jacket Dynamix Statue stands approximately 9-inches tall and includes a Doctor Who logo base, packed in a TARDIS-themed window display box. Ages 14 and up.